Michael Rennie was ill the day the Earth stood still and he told us where we stand. [Everybody sing!] The Day the Earth Stood Still is a brilliant movie. Released in the aftermath of WW II, it stood as a warning, and a promise, for the future of the earth. Unfortunately, we’re just as stupid now as we were back then! The amazing thing about this movie is that it sounds as fresh today as it did in 1951. 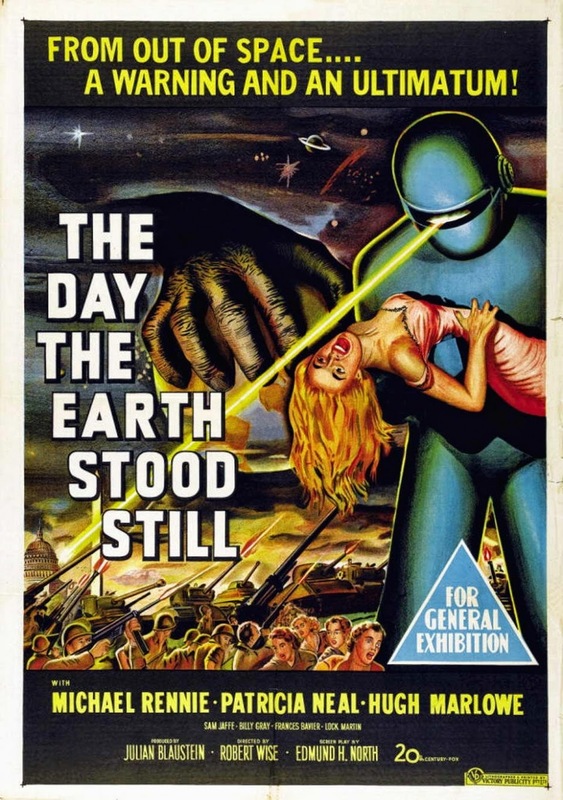 The “if you don’t understand it, kill it” philosophy is firmly entrenched in our world and, according to Klaatu [Michael Rennie] who came to evaluate us as a species, we are STILL a failed experiment. Joining Rennie is the radiant Patricia Neal [Breakfast at Tiffany’s, Hud] who saves the world’s posterior by befriending Rennie and supporting him on his quest. Joining these two is the sweet 1950’s kid Bobby, who is played nicely by Billy Gray who was also in the hit TV show Father Knows Best. Oh, and there’s also a small role for Frances Bavier who played the iconic Aunt Bee a on The Andy Griffith Show! Sweet! From a technical aspect, The Day the Earth Stood Still looks great. The Sci-Fi elements are good for their time and don’t come across as too hokey. The robot is definitely iconic in its design and is different from others I’ve seen. It works really well and the decision for it to remain silent was a good one. It adds to the menace. Furthermore you can’t go wrong with director Robert Wise [The Andromeda Strain, Star Trek: The Motion Picture] who gave us such iconic films as The Sound of Music and West Side Story. The guy totally knows what he is doing and his direction in this film is smart and confident. Everything about The Day the Earth Stood Still works well. If you haven’t see it yet, what are you waiting for? Forget about the 2008 sequel and savor the original. It’s classic 1950’s Sci-Fi at its very best.